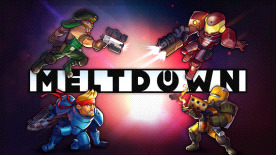 Meltdown is a tactical arcade shooter featuring both singleplayer and intense online multiplayer. Set against a captivating sci-fi backdrop, the action game invites players to follow its main character, Zed, as he tries to shoot his way out of the remote space station that he has been trapped on as a result of a system malfunction. During the course of the adventure, players can collect loot and level-up their character as they make their way through randomly generated levels. They can choose to play single player or co-op multiplayer, while experiencing an engaging gameplay, matching their gaming skills and style. Clear all the missions and run the prestige mode!